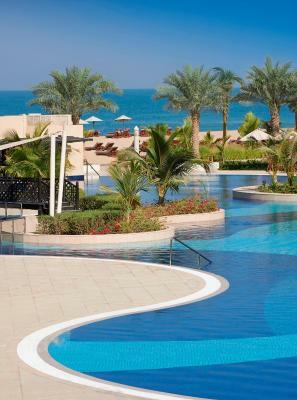 Lock in a great price for Waldorf Astoria Ras Al Khaimah – rated 9 by recent guests! The hotel looks beautiful. The rooms are spacious, comfortable and clean. The breakfast and dinner (as part of half board) exceeded our expectations with regard to both variety and taste. And although the hotel was full, we felt the breakfast and dinner were well organized. Actually, everything in the hotel ran very smoothly. And the family pool is lovely. Our check-in was fast and efficient. Staff is very dedicated and helpful. Nitika at fornt desk went out of the way to solve some problems and ease my stay. easily accessible; near the mall in case you missed to bring some items. near the city proper and some tourist spots to wander around. food was great, lots of variety. staffs were accommodating. open spaces are well kept. routine replenishing of consumables is a thumbs up. The staff was wonderful and facilities immaculate. 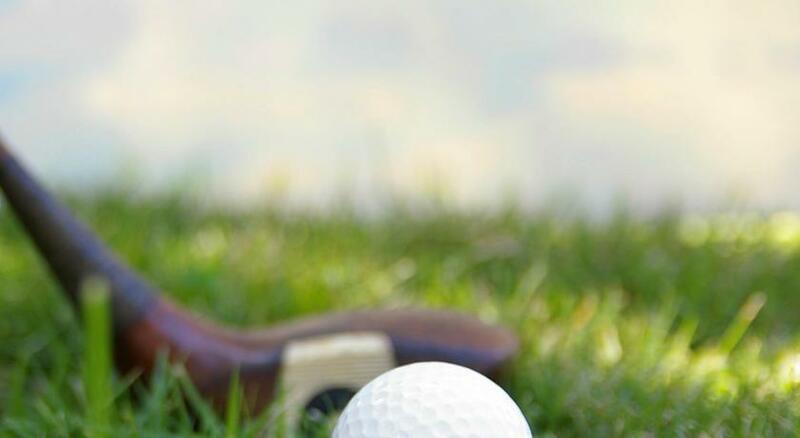 Great location, excellent facilities and helpful staff. Every thing was perfect,staff was friendly and helpful,he upgraded our room to a junior suite without extra cost,breakfast was amazing,beach was wonderful.we enjoined our stay so much. One of the best hotels I have visited for the last 3 years - The room size is very comfortable for us as family. - the location of hotel is amazing. - the swimming pool is very clean - the beache is awesome - the staff is lovely and very friendly specially the front manager Mr.Andrew as well as the security supervisor - it is value for money!!!!!!!! 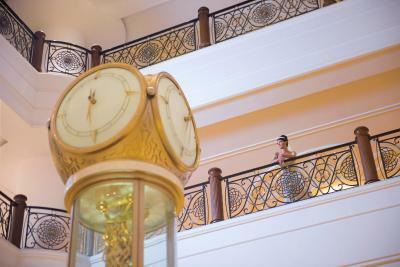 - the housekeeping is amazing very helpful, friendly they are the stars - we love it three much !!!!! 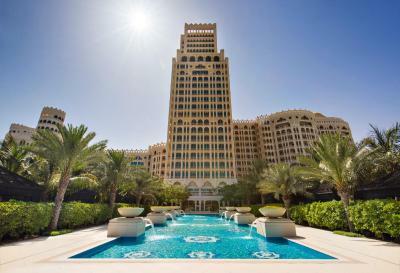 Waldorf Astoria Ras Al Khaimah This rating is a reflection of how the property compares to the industry standard when it comes to price, facilities and services available. It's based on a self-evaluation by the property. Use this rating to help choose your stay! 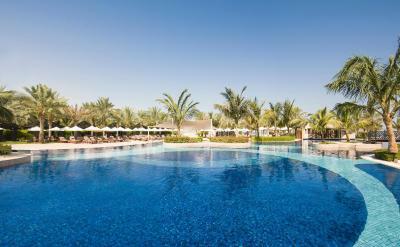 One of our top picks in Ras al Khaimah – and a guest favorite. 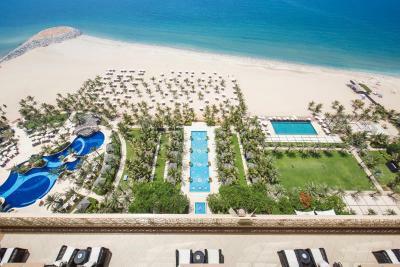 Inspired by the palaces of the Arabian Peninsula, Waldorf Astoria Ras Al Khaimah is a beach front location ideally located 50 minutes from Dubai International Airport. 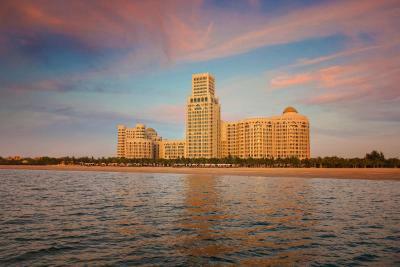 It offers a luxurious spa, an 18-hole championship golf course and a 1,050 feet private beach, set against the azure water of the Arabian Sea. 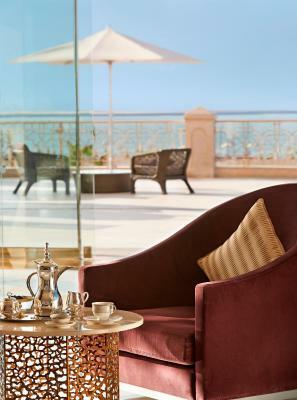 The elegant rooms at Waldorf have upholstered seating, work desks and views of the sea, golf or the garden. Each one offers an electric kettle, I-docking station and a working desk. The bathroom is fitted with a bathtub and a rain shower. 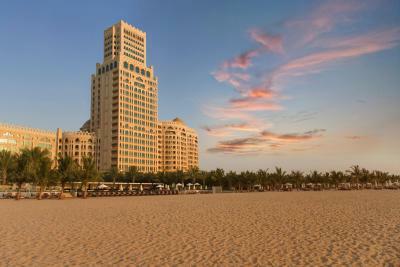 Dining options for guests of the Waldorf Astoria include eclectic choices of international and local cuisines. Savor classics steaks and grills at Lexington Grill and Japanese cuisine at UMI with teppanyaki and sushi. Relish elegantly presented home-style dishes at Marjan and go on a culinary adverture at Qasr Al Bahar, the main dining restaurant.Siddharta Lounge by Buddha Bar features a fresh urban ambiance with breathtaking 360-degree views of The Arabian Gulf. 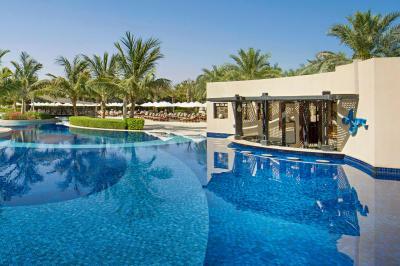 The hotel’s spa offers signature treatments and a place where guests can surrender and restore personal well-being. The gymnasium features an extensive range of Technogym equipment and two flood-lit tennis courts. 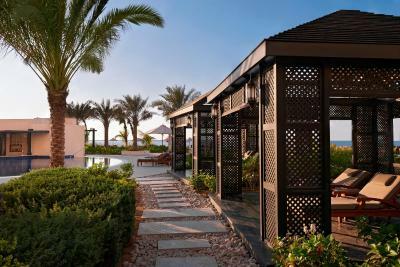 Guests can visit Musandam Peninsula which is 31 mi away from Waldorf Astoria. National Museum of Ras Al Khaimah is also within a short driving distance. Free private parking is possible on site. 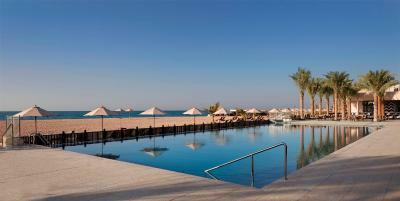 Al Hamra Village is a great choice for travelers interested in beach walks, beaches and kid-friendly beaches. 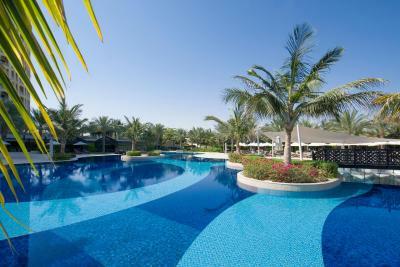 This property also has one of the top-rated locations in Ras al Khaimah! Guests are happier about it compared to other properties in the area. 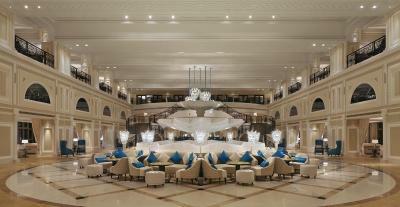 When would you like to stay at Waldorf Astoria Ras Al Khaimah? 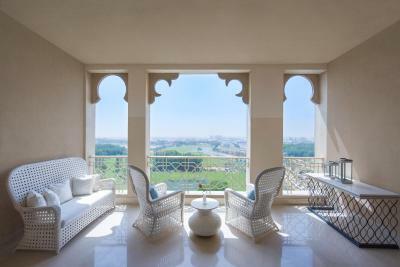 Featuring a balcony with Golf course views, this extra spacious room is inspired by the palaces of the Arabian Peninsula. It is equipped with a 42-inch LCD HDTV with premium channels, I-docking station and a coffee machine. Furnished with 2 Queen beds, a comfortable seating area and a work desk complete with a telephone. It features a marble bathroom with soaking tub and separate rain shower. 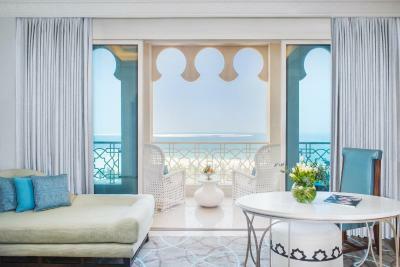 This opulent suite offers a sea view, a separate bedroom with king-sized bed, elegant living room, queen sleeper sofa bed, and two bathrooms. Features include a 42-inch HDTV with premium channels, I-docking station and a coffee machine. Conveniently, the room includes a working desk complete with a telephone. It has a marble bathroom with soaking tub and separate rain shower. 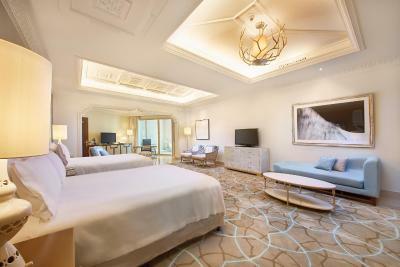 Inspired by the palaces of the Arabian Peninsula, this bright and airy room is equipped with a 42-inch HDTV with premium channels, I-docking station and a coffee machine. Furnished with two queen beds, comfortable seating area and a work desk complete with a telephone. It features a walk-in closet, an elegant marble bathroom with soaking tub and separate rain shower. Featuring a balcony with sea view, this spacious, airy room is equipped with a 42-inch HDTV with premium channels, I-docking station and a coffee machine. 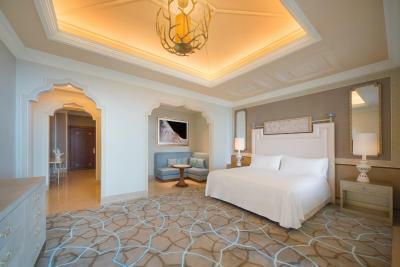 Inspired by the Arabian Palaces, this room is furnished with 2 queen beds, a comfortable seating area, and a work desk complete with a telephone. 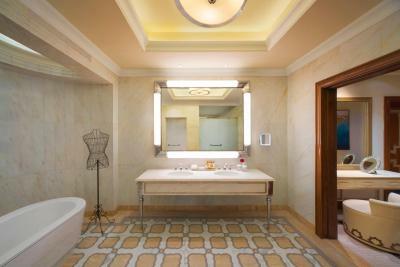 It features an elegant marble bathroom with soaking tub and separate rain shower. Featuring views of the golf course and the majestic sea, this suite includes a separate king bedroom, a foyer with a bathroom, and a balcony. It includes a 42-inch HDTV with premium channels, docking station and a coffee machine. Conveniently, the room also has a work desk with a telephone. It has a marble bathroom equipped with a TV in the mirror, a soaking tub and separate rain shower. This room is suitable for two adults and a child. 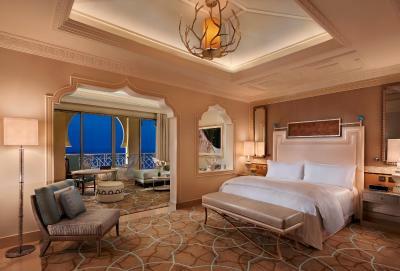 Featuring a balcony with Golf course views, this extra spacious room is inspired by the palaces of the Arabian Peninsula. It is equipped with a 42-inch LCD HDTV with premium channels, I-docking station and a coffee machine. Furnished with a king bed, a comfortable seating area and a work desk complete with a telephone. It offers a marble clad bathroom with soaking tub and separate rain shower. 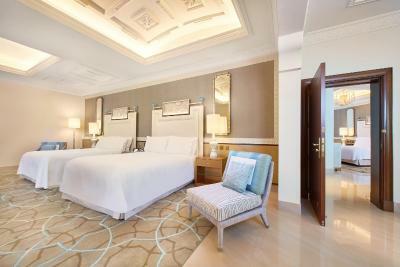 Inspired by the palaces of the Arabian Peninsula, this bright and airy room is equipped with a 42-inch HDTV with premium channels, I-docking station and a coffee machine. Furnished with a king bed, comfortable seating area and a work desk complete with a telephone. It features a walk-in closet, an elegant marble bathroom with soaking tub and separate rain shower. This extra spacious suite has a king bedroom, a foyer and a free-standing bath. The room features include a 42-inch HDTV with premium channels, i-docking station and a coffee machine. Conveniently, the room includes a work desk complete with a telephone. It has a marble bathroom equipped with a TV in the mirror, a soaking tub and separate rain shower. 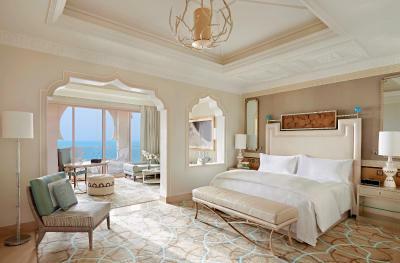 Featuring a sea view, this extra spacious suite has a lavish lounge area. It includes a 42-inch HDTV with premium channels, i-docking station and a coffee machine. Beautifully furnished, it includes a luxurious king bed, oversize separate dressing room, a work desk complete with a telephone. It has a marble bathroom with soaking tub and separate rain shower. 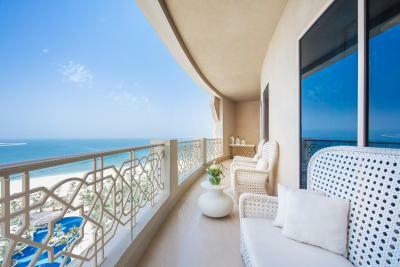 Featuring a balcony with sea view, this extra spacious suite has a lavish lounge area. It includes a 42-inch HDTV with premium channels, i-docking station and a coffee machine. Beautifully furnished, it includes a luxurious king bed, oversize separate dressing room, and a work desk complete with a telephone. It has a marble bathroom with soaking tub and separate rain shower. Suitable for three adults. Featuring a balcony with sea view, this spacious, airy room is equipped with a 42-inch HDTV with premium channels, I-docking station and a coffee machine. 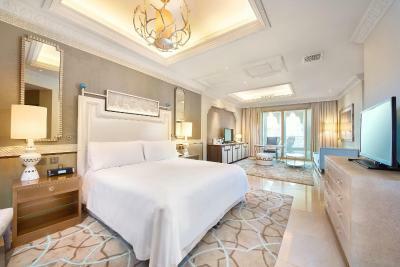 Inspired by the Arabian Palaces, this room is furnished with a king bed, a comfortable seating area, and a work desk complete with a telephone. 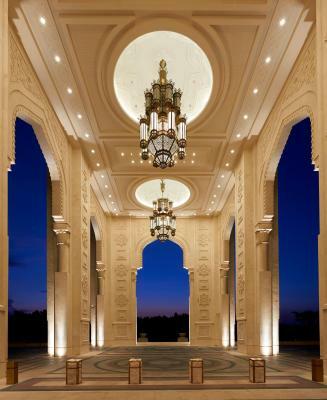 It features an elegant marble bathroom with soaking tub and separate rain shower. 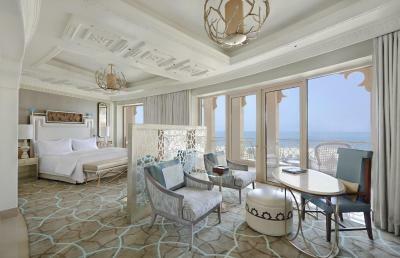 This extra spacious suite offers magnificent views of the sea from the balcony. It features a 42-inch HDTV with premium channels, I-docking station and a coffee machine. Opulently appointed, it presents a king bed, oversize separate dressing room and lavish lounge area and a separate sofa bed. Conveniently, the room includes a working desk complete with high-speed and wireless internet access and a two-line speaker phone with voicemail. The marble bathroom comes with soaking tub and separate rain shower. Suitable for two adults and two children. Spoil yourself with a stay in this King Royal Suite and enjoy views of either the golf course or the sea. 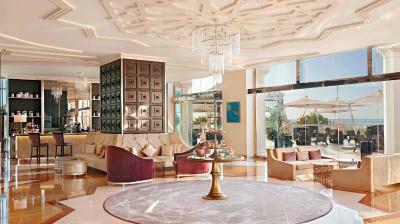 This spacious suite stands exclusively on its own floor with a VIP elevator and direct private spa access. Each of the 2 bedrooms come equipped with a king or 2 double beds and an private bathroom. A separate living area features a 42-inch HDTV and stay connected with WiFi access. Admire the views from the balcony of this abundantly expansive suite which is located over two floors and has its own private internal staircase. The suite features a king bedroom with an private bathroom, and a living room with a grand piano and a further private bathroom. For your entertainment there is a 42-inch HDTV and WiFi access, and a make a meal in the kitchen which also has a dining table. 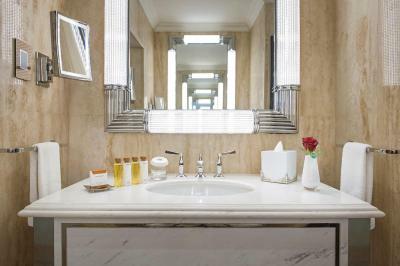 Each suite has a marble bathroom equipped with a television in the mirror, a soaking tub and separate rain shower. 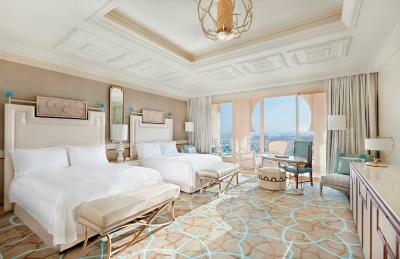 This suite features a mini-bar, view and air conditioning. 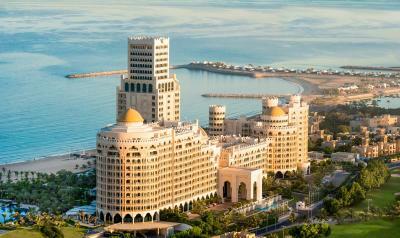 Opening doors to international travelers in August 2013, the Waldorf Astoria Ras Al Khaimah has gained an enviable reputation as one of the UAE's leading luxury hotels. 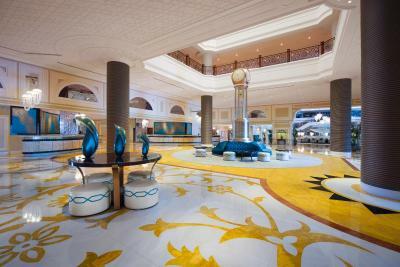 The hotel is cradled by the Hajar Mountains, a championship golf course, white sandy beaches and the azure waters of the Arabian Gulf. 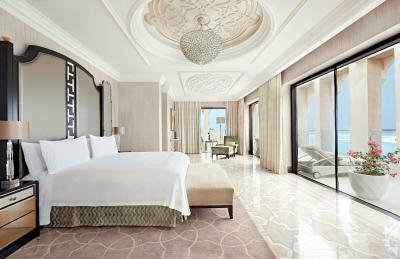 The 346 deluxe rooms and suites reflect the palatial surroundings and offer the luxury of space and tranquility. 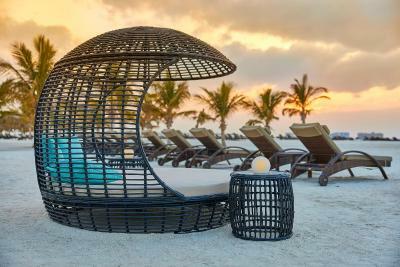 With an exclusive choice of 9 signature restaurants & bars, guests can experience bespoke dining from the trendy Japanese restaurant UMI, the multi-award winning Lexington Grill or the a poolside Azure restaurant with an inspirational Mediterranean menu. 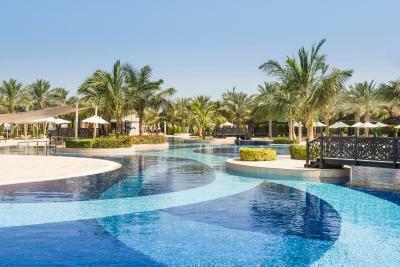 The resorts onsite leisure facilities offer a wide range of activities, including a Health Club with the latest Technogym equipment, personal training services (subject to a nominal fee), Tennis Courts, watersports activities, an 18 hole gold course and a state of the art Waldorf Astoria Spa. Area Info – This neighborhood is a great choice for travelers interested in beach walks, beaches and kid-friendly beaches – Check location Excellent location – show map Guests loved walking around the neighborhood! WiFi is available in the hotel rooms and costs AED 50 per 24 hours. 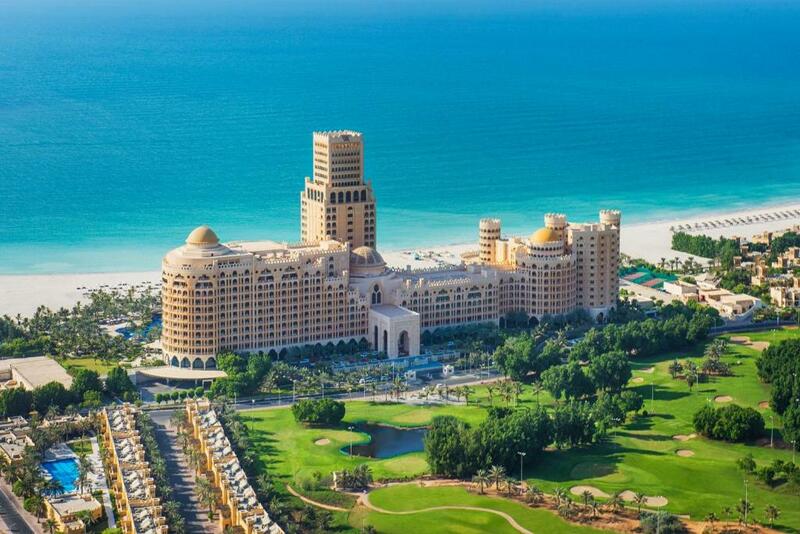 House Rules Waldorf Astoria Ras Al Khaimah takes special requests – add in the next step! 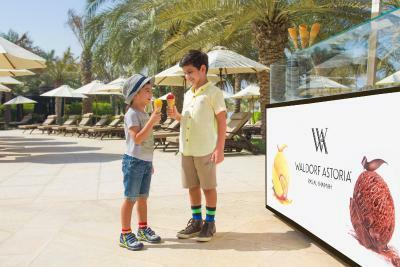 Waldorf Astoria Ras Al Khaimah accepts these cards and reserves the right to temporarily hold an amount prior to arrival. Please note that children between 6 to 12 years of age will be charged 50% of the rate for breakfast . Children above 12 years will be charged the full price. 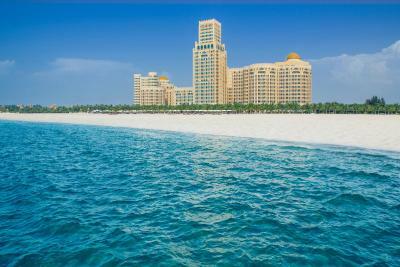 Kindly note that guests that book the half board rate can only have the buffet meals at Qasr Al Bahar. Such a peaceful break away from Dubai. Loved the adult pool and Lounge area. The room was absolutely huge and grand. Wish I had a week in this place! Also the staff went over and above to make our stay amazing including upgrading our room and late check out! Love. A small incident with the lady at the front desk. Other than that, staff were helpful and courteous. Check in was late and room was not ready ! We booked our room with breakfast and dinner included . I was surprise that at dinner I had to purchase water . I think at least a bottle of water per table should be complimentary. 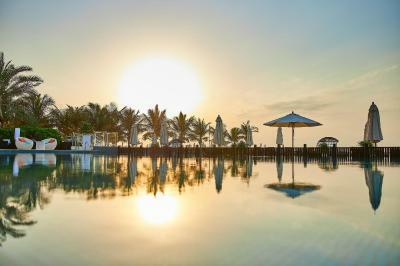 I really enjoy my stay , we were spoiled the all time by the staff and by the all facilities that the resort provides for their guest. We will sure visit again . The Lexington grill was very disappointing as no lamb chops on the menu and this was one of the reasons we used to go there and the wine is so over priced!! We loved the pool area and the breakfast.